We attempted to take a picture in front of Skogafoss… I clearly was NOT into it after standing there for a second and already getting soaked. On this particular day, negative #3 was the primary bummer. 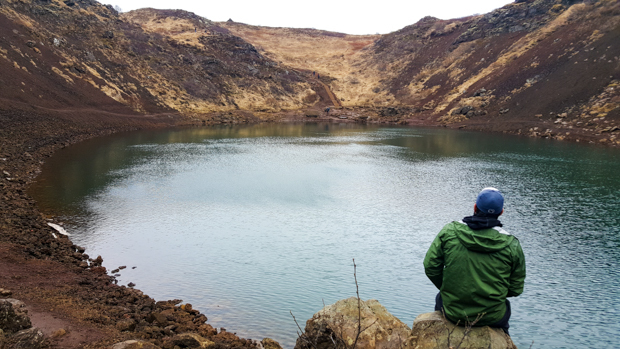 Mike and Tony were excited about this hike (Fimmvörðuháls) that starts at Skogafoss, the waterfall where we spent the night. It’s supposed to be beautiful. It goes past a bunch of waterfalls and through diverse landscapes, and the whole thing (one way) takes 12-14 hours. 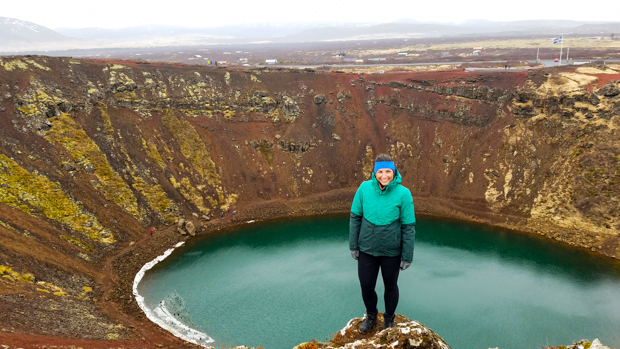 We obviously weren’t going to do it all… we didn’t have the time, plus we had the car parked at Skogafoss, but we were hoping to hike for at least a couple of hours. Our day started out as usual. We dragged ourselves out of the warmth of our sleeping bags, got ready and changed as quickly as possible (because brrr! ), and put the tent and camping supplies into the car. We were prepared for a hike of an unknown length because, despite all of the research Mike and Tony did, they couldn’t tell exactly how much of the trail was going to be hike-able. There wasn’t information online about trail closures except to say that some parts of the trail may be closed at certain times of the year. They decided that we’d go as far as we could, and that sounded like a good plan to me! So, we got ready for anything that might come our way and then set out with enough water and snacks for an army (a very small army… of three). 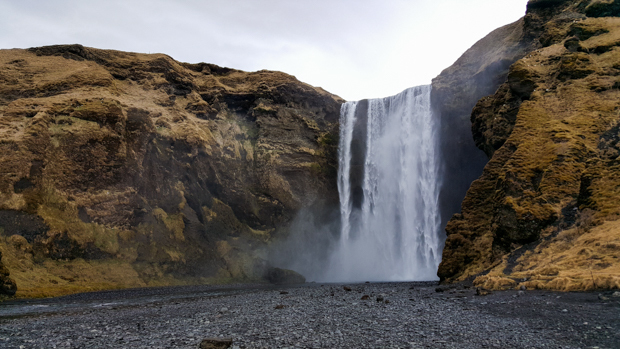 First, we got up close and personal with Skogafoss… and then Mike had to change his pants because they weren’t waterproof and got completely soaked by the falls… and then we started the hike by walking up the seemingly endless stairs to the top of the cliff. The stairs were particularly annoying because they aren’t quite tall enough, so you can’t decide if you should go up one at a time or two, but they’re kind of long so two is a stretch (literally). Then as soon as you figure it out, you realize that they’re changing height and getting taller and you have to reevaluate everything. Who knew that going up stairs could be such a mentally exhausting experience? 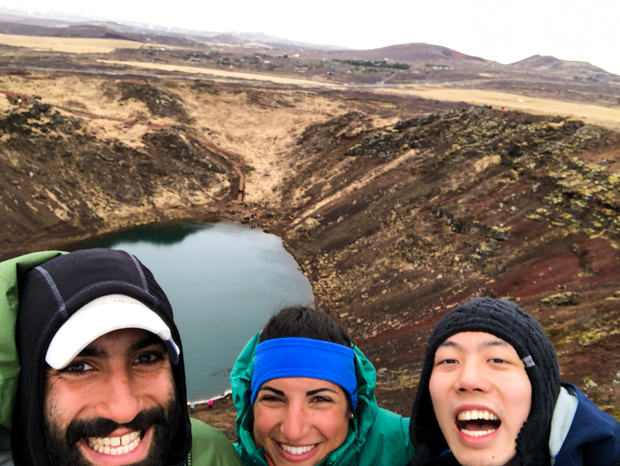 When we made it to the top (Tony and I were out of breath and Mike was not), we stopped to see Skogafoss running off the side of the cliff before continuing down the trail. A few steps later, we passed waterfall #2, and Tony started up a waterfall count for the hike because we were supposed to see a ton. It unfortunately turned out that we didn’t need a waterfall count after all. At waterfall #3, there was a sign blocking the trail. Closed for the season. That was a bummer. Closed trails and changed plans are a part of life, but the most frustrating thing was that the only sign indicating the trail closure was about a mile into the hike. 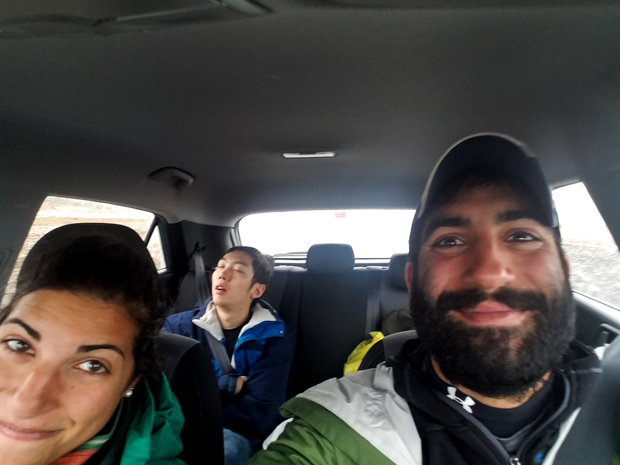 It would have been nice to know from the beginning, rather than preparing for hours of hiking only to find out 20 minutes in that it wasn’t going to happen. 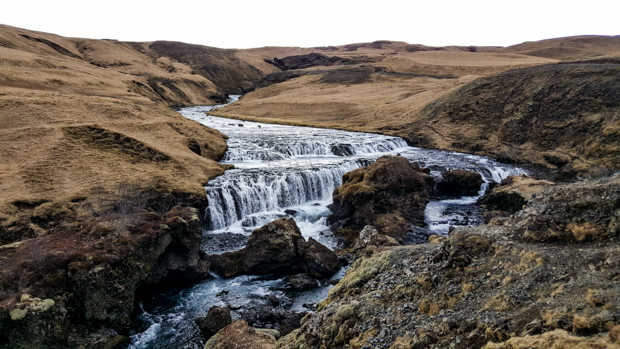 Side note though, if you’re into hiking and are going to Iceland in the summer, this hike looks amazing and you should do it. We had a lot of extra time on our hands after the hike got crossed off the list. 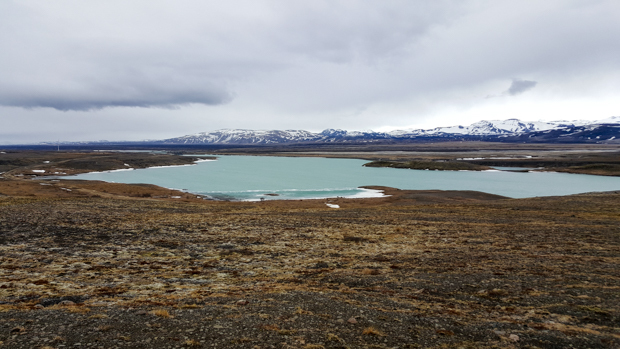 We tried to find something else to do along the road back to Reykjavik… and searched for a hot stream that ended up being closed as well. Okay, not ideal. 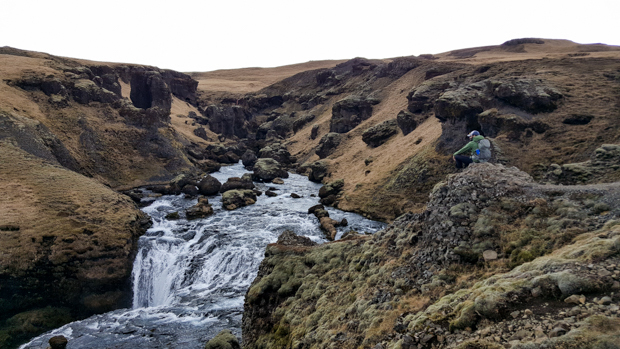 Tony found a different waterfall on the map, Hjalparfoss, that was along the way and sure to be open, so we went there. I think it was mostly just so that we could do something that didn’t fail. We needed to turn our luck around! 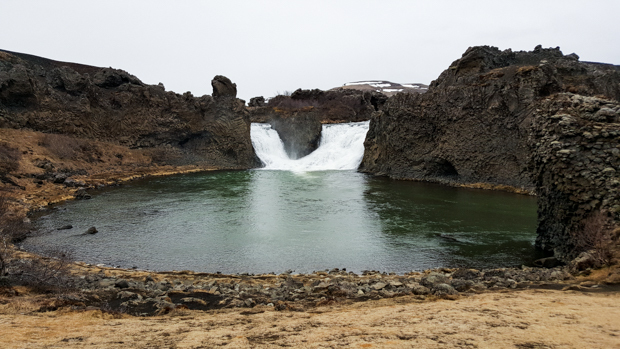 Hjalparfoss in all of its glory. Mike liked it because he likes “waterfalls with some substance”. 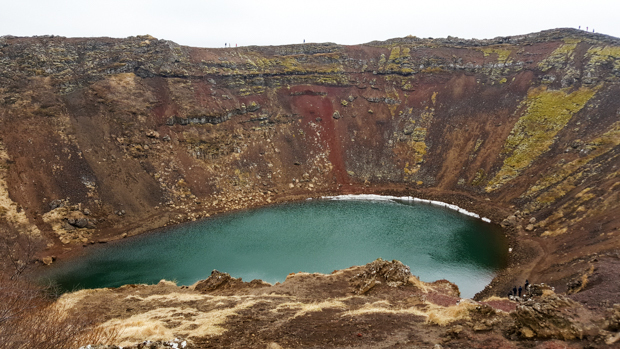 Tony mentioned another sight that we could visit, Kerid Crater. Sometimes people do it as part of the Golden “Circle”, but Mike and I didn’t, so we decided to make that our next destination. Tony had already been, but he was happy to check it out again. 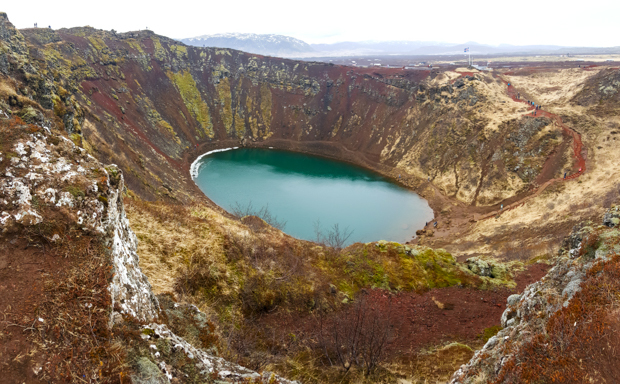 He said that when he visited just a few weeks before, the crater was covered in snow and ice! We could see a little leftover snow, but for the most part, any indication of winter was gone. Tony also said that the water level was much higher before. 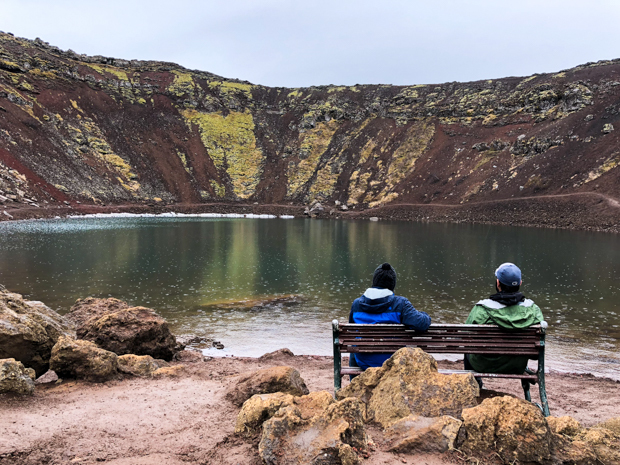 His reference point was a bench at the bottom of the crater that was underwater during his first visit. This time, I took a few pictures of him and Mike sitting on the bench. Hehe. 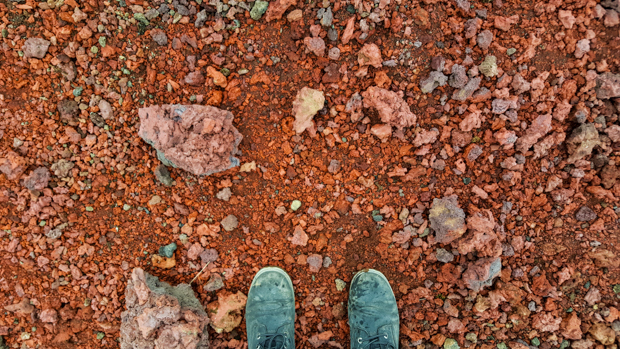 We walked around the rim of the crater and next to the water at the bottom, explored some of the other craters next to Kerid, and laughed at the perfect rows of trees that we could see in the nearby forest. 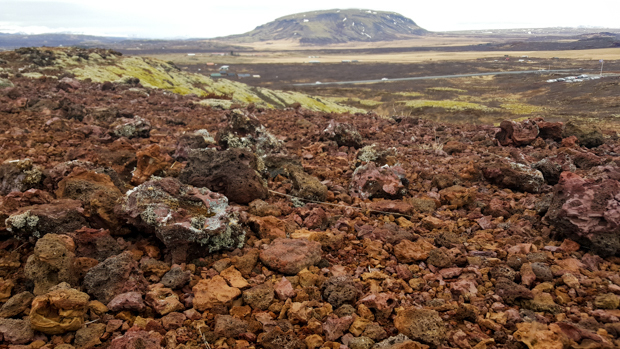 Oh, the wonderful, unnatural foliage of Iceland. 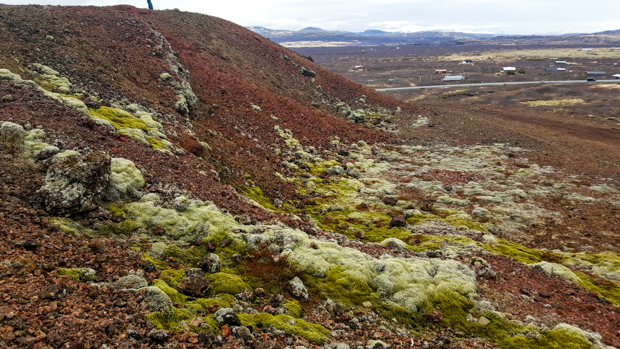 Between the funky soil and the strange ground plants, everything about the landscape here confuses me. Have you ever seen a picture crater than this one? 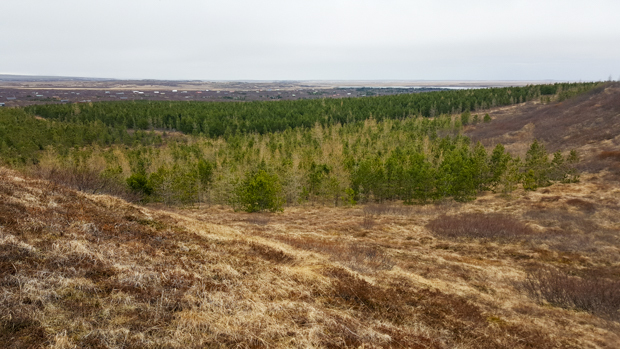 Check out that all-natural forest! 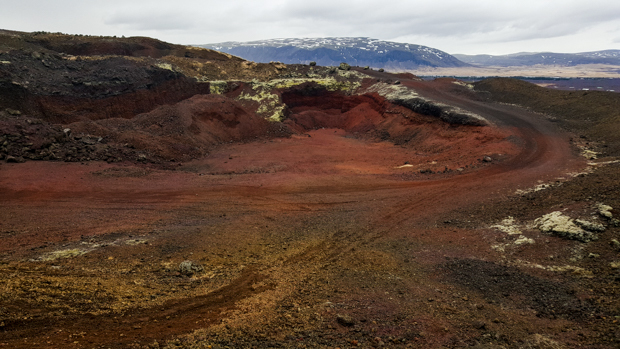 Once we had our fill of vibrant soil and freakish landscapes, we finished the drive back to Reykjavik. I was so excited to eat something besides peanut butter sandwiches and protein bars! Those were our primary food staples when we were on the road, and I think I got to the point where my mind didn’t even register them as food anymore. First, we took showers because… well, it had been a while. Second, we went out for $20 Thai food again. 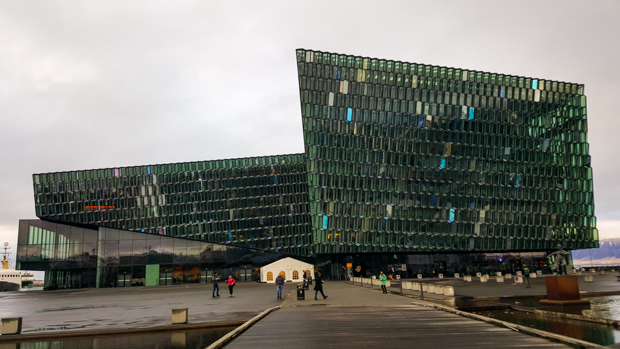 Third, since we got back earlier than anticipated, we had time to check out some things around Reykjavik that I wanted to see! 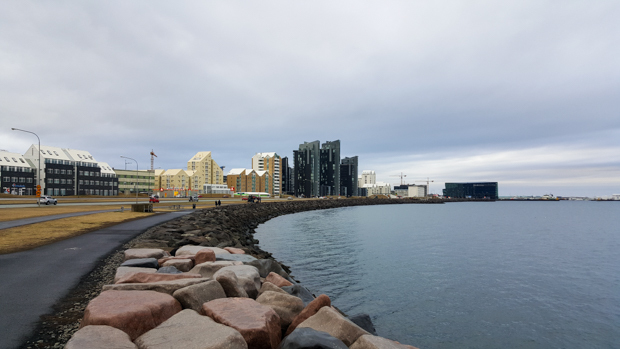 We had a nice walk along the water on our way to the concert hall. 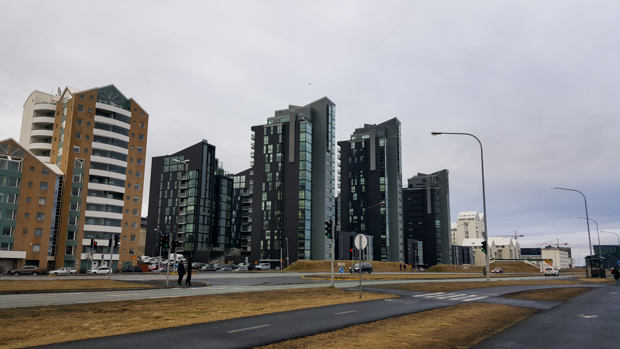 The buildings look like they were made out of boxes. Weirdly tall buildings. Most of the buildings in the city are only a few stories, so these really stick out. I don’t think Mike or Tony cared much about seeing the city, but oh well for them. I had done some research, and there were a few buildings that I was determined to see. Plus, I just wanted to walk around a bit because it’s fun to explore new cities in interesting places. 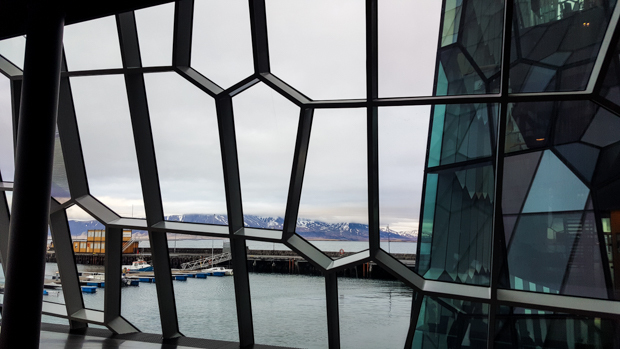 Our first stop was Sun Voyager, a sculpture installed in commemoration of the city of Reykjavik’s 200th anniversary. 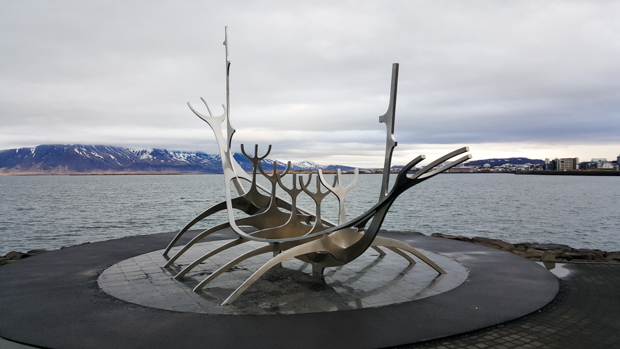 It’s made of stainless steel and looks like a Viking long-ship, but it’s intended to be “a dreamboat and ode to the sun”, symbolizing “the promise of undiscovered territory, a dream of hope, progress and freedom.” Whatever it’s supposed to be, it is pretty, especially with the backdrop of the water and distant mountains. Sun Voyager! I waited for at least 3 minutes (specific, I know… it wasn’t quite 5 but definitely more than 1) until I could snap a picture without any unwanted tourists in the way. 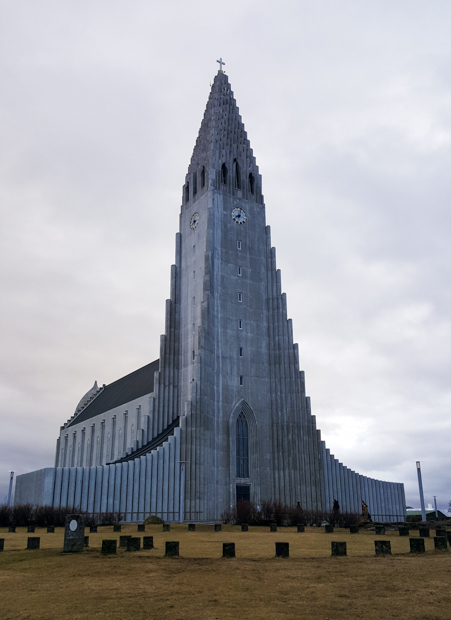 The next two stops were the ones I was really pumped about: the concert hall/convention center and the church. 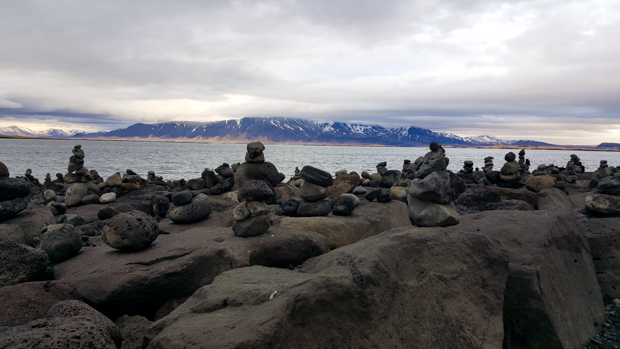 Remember the hexagonal troll rocks that we saw at Reynisfjara and later at Svartifoss? 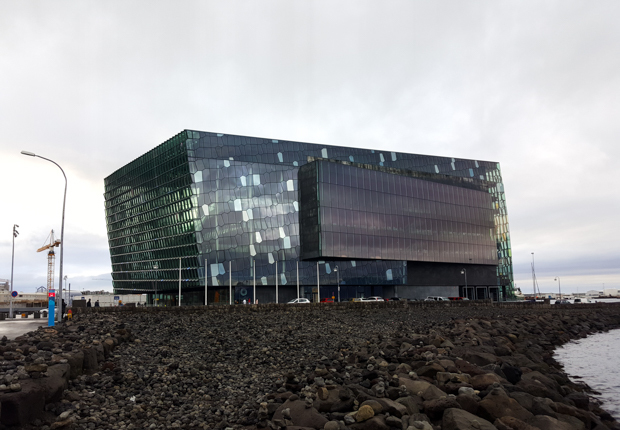 Those rock formations seem to be the basis for basically all of the nature-inspired architecture in Iceland. The concert hall/convention center? Yep, it has a design that was inspired by the troll rocks. The church? TROLL ROCKS. 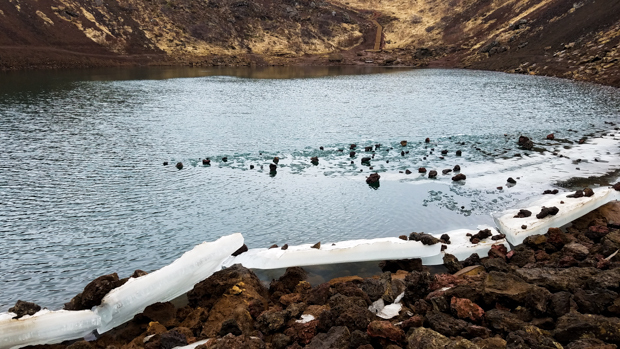 It almost makes it seem like those are the only interesting thing in Iceland since that’s all anyone uses as inspiration, but that’s totally not true, as you’ve seen. I don’t know. I think people need to be a little more creative because come on, the rocks are such an easy choice. I want to see a geyser or volcano or Diamond Beach-inspired building. We got to go inside the concert hall/convention center which was VERY exciting because I especially wanted to see the ceiling in the main atrium. I don’t know if it’s always open, but there was a gaming convention happening while we were there. Maybe we just got lucky for once! Cairns outside of the concert hall. Don’t ask me why because I don’t know. The geometry of the windows is definitely reminiscent of the rocks, but I thought this looked more like a pile of bubbles. There’s another place where the troll rock inspiration is much more obvious. THIS is the ceiling of the main atrium, and if you can’t see the hexagonal troll rocks in this, you’re not going to be able to see them anywhere. 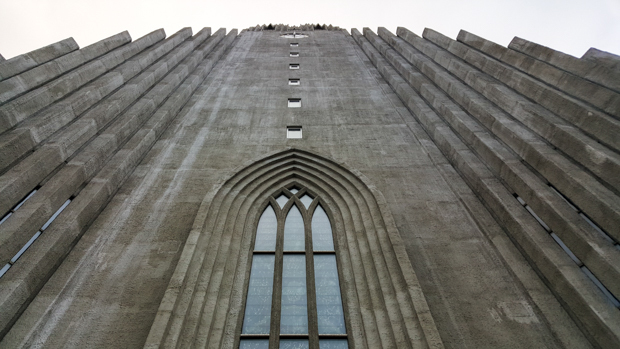 The church (Hallgrímskirkja), unfortunately, wasn’t open. Not surprising considering it was about 9PM, even though it didn’t feel that late since it was still light outside. I’ve seen pictures of the inside, and despite the funky façade, it’s otherwise surprisingly traditional-looking. Very pretty though. It’s on the list for next time! You can definitely see the troll inspiration. 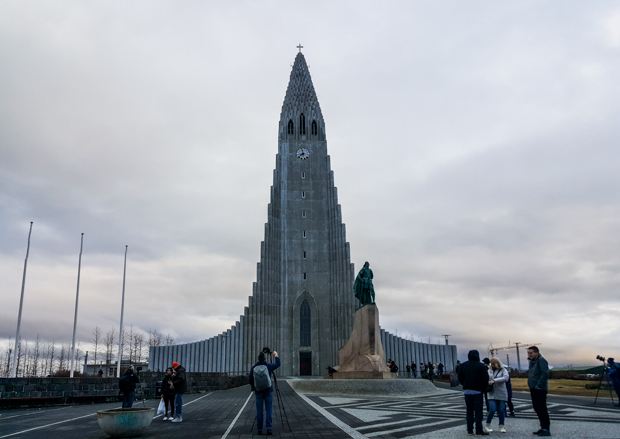 In front, there’s a statue of Leif Erikson (the first European explorer known to have set foot in North America. He settled in Greenland). 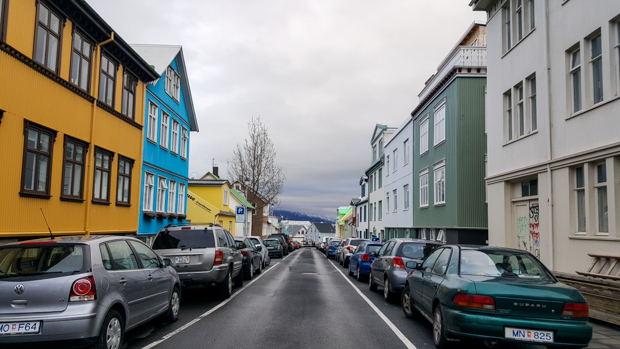 Reykjavik street. I love the simplicity and the colors of the buildings. It’s like a cardboard city. When we got back to Tony’s apartment, he and Mike planned for our last day of exploring while I attempted to start planning for my next stop! 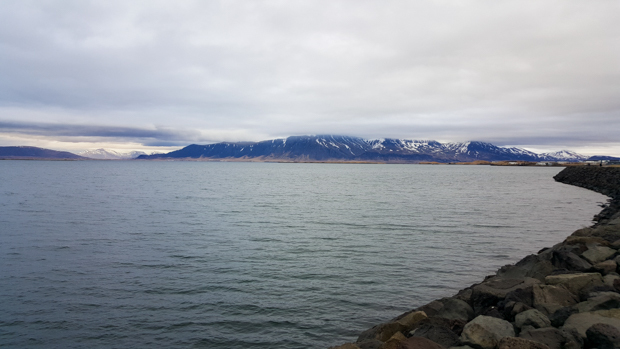 But we still had one day left in Iceland, so I won’t get ahead of myself. That night was luxurious. I slept on a sofa bed and didn’t have to wear a winter coat to bed. A 5-star sleep experience! 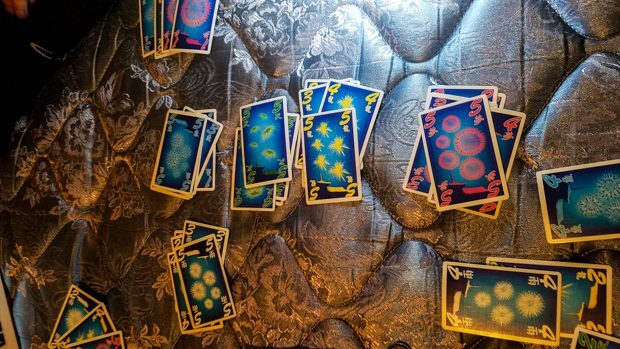 We played more pre-bedtime card games, and this photo is to prove that we played a perfect game. It’s this card game called Hanabi that Mike is obsessed with at the moment. I’ll admit that it’s pretty fun.